I will call him Nicholas – an English variant of his Romanian name. Nicholas has a toothy grin that he often flashes, revealing the deep joy of childhood. He is the youngest of four brothers and an uncle to a two-year-old nephew. He lives in social housing at the top of a hill in the city’s flood plain. On my first visit to Nicholas’ home, I was greeted by pigeons fluttering overhead and chicks and ducks filing along the narrow path that led up the hill. In the cleft of the clay, Nicholas’ family has built a roost for their various poultry. 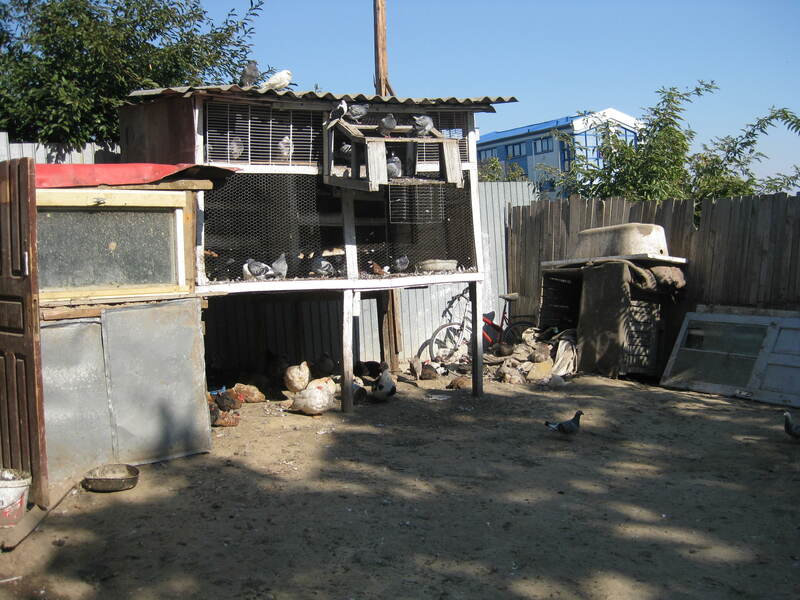 Nicholas had told me about his flock of pigeons that he faithfully cared for, but I didn’t know about the ducks and chickens. I thought that they must be a good source of food for the family, only to learn from his mother that they are too attached to them to slaughter them. The family cares for the birds out of the pure joy of having them. (They do have a pig, fattened on kitchen scraps that they will butcher at Christmas). Christmas – this year will be a difficult holiday for Nicholas’ family. In the center of their small yard, they have dug an outdoor toilet. 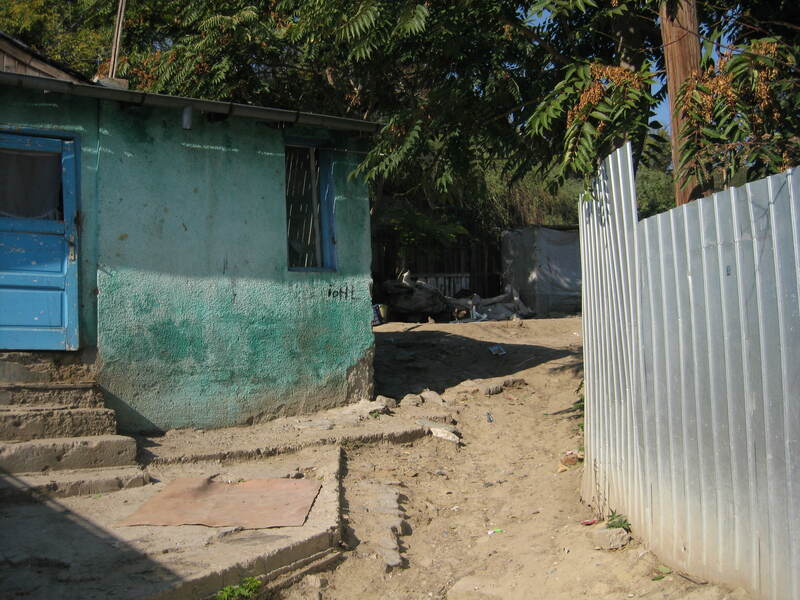 On the other side of the yard is their small, two-room house, built out of a wood frame and thatch. Although they have no running water, they have a little kitchen in the entry way, where they cook on a small gas-powered stove. The cracked and corroding floor is insulated with rugs, and couches covered with wet laundry line the wall. When the family finds wood scraps or when they receive firewood from a benefactor, their terracotta stove heats up the main room in which there is a large bed and a television that is always turned on. On the bed lies Nicholas’ father. He body is emaciated, the skin hanging loosely from his protruding bones. Last year the family learned that their father has cancer. Although he wasn’t employed with proper working papers, he did work and he did bring home money and food. Nicholas has watched his father change from the strong bread-winner to one who is weak and dependent. As his father has grown weaker and weaker, so Nicholas’ attendance at school has been less and less frequent, his tantrums and fights with schoolmates have become more recurrent, and his joyful smile is shown more and more seldom. It is a strange world in which cancer is “good” news for a family. Because Nicholas’ mother has to carry her husband without wheelchair to the outhouse or to the hospital and has to cook and clean for him, she is given a monthly “care-giver” salary. Without this source of income, the family would be even more desperate. Last week Nicholas and I worked off some of his surplus energy by digging in the garden. As we plowed up the soil, I asked him about his grandmother and cousins who live on the other side of the tracks in a squatter community. Although his extended family is living in an even more impoverished environment, Nicholas smiled widely as he told of his grandmother and of all his little cousins. When I asked them what they would do for Christmas, Nicholas just shrugged. Then I asked him if he would like give his cousins presents for Christmas. I explained that he would have to work a few hours in order to get the gifts. Nicholas smiled again, and then he started to dig faster. Although we are witnessing the inner and outer turmoil in Nicholas and his family, his joy and his generosity remind me of Nicholas’ namesake, a saint famous for his gift-giving and his prayers for healing. In the English-speaking world, we have blended Saint Nicholas with Father Christmas, but in other parts of Europe, Saint Nicholas is celebrated on December 6th. 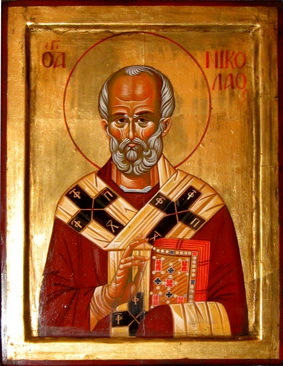 Saint Nicholas was a fourth-century bishop, credited for bringing healing to the sick through his intercessory prayer. He is also famous for his secret gift-giving. After visiting the Saint, children often found coins in their shoes. That led to the tradition, still practiced in Romania, in which children leave their shoes at the door in order to find them in the morning, filled with gifts. Unlike Saint Nicholas, our Nicholas doesn’t benefit from a stable church community, the luxury of a good education, or the wealth of the episcopate. Yet, our Nicholas opens a window through which we see surprising sources for joy and giving. Although he has little, Nicholas is a miraculously full of generosity. Although his family is needy, they are full of compassion, even for dozens of pet birds. Although Nicholas is presently experiencing deep pain, his smile cannot be restrained. We pray that Nicholas will be graced with the other charisma of his namesake: healing. With Nicholas and his family, we pray that God would touch and heal his father. We pray that God would be especially present to them this Christmas. And, as Nicholas gives the presents that he worked for to his little nephew and cousins, we pray that the joy and generosity evident in Nicholas’ life will touch others. Thanks for this glimpse into the joy and generosity of Nicholas! I remember experiencing something similar in Bucharest when I was offered a bowl of cherries by a little boy as he excitedly showed me his “home” where he stayed with other street kids in the bottom of an abandoned electrical building. His hospitality was generous and full of grace. I remember thinking that this is what Mother Teresa meant when she said that she saw Christ in the face of the poor. I certainly experienced that moment as an embodied, enfleshed example of God’s generosity and love.